Today I have been working with kinetic typography and making a video reflecting my movement. Started out by researching kinetic typography and found the Swiss designer Dominique Schmitz very inspirational. Similar to the Zero movement his work is full of lines and overlapping elements creating vibration and movement and I especially liked these two seen below. Even the colours are right. Initially I wanted to create something like the left example as it feels like a modern spin on what I am looking into but then I started thinking about type as image and got more interested in how I could use type to create pictures and started sketching with the letters I, Z and O. The above quote is what I have been basing my pastiche on. It’s by Calder and captures his way of creating so well and summarises his work weather it be static or moving- he composes motions. After making five animations I didn’t like with planes turning into stars or flowers in different ways and with different planes and backgrounds I decided the problem with all my videos was that they weren’t weird enough. So I made it weirder. 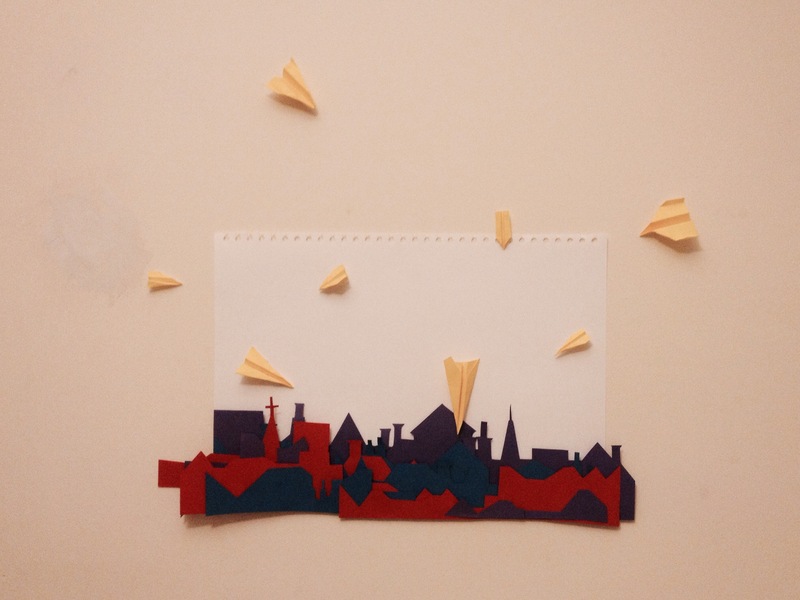 At my first ever try at stop motion animation this week I’m transforming paper planes into flowers. I’ll post the result as soon as I’m done with it but for now I’m having too much trouble getting the animation to the right kind of feel. Whatever I do, it just looks too dainty and delicate. I need to rough it up but my head is full of airplanes making it hard to think. A couple of days ago we stumbled upon an animation in class. And it’s amazing. Amazing. I’m not completely sure why I like it so much but I’ve now watched it ten times and linked it to five people already. There is something about the overall pacing of the video that’s just so perfect as it jumps from slow parts to parts where nothing stands still so effortlessly. I also like the gritty feel of the darwings, the smudged pencil lines and the wrinkled paper. Maybe I like it so much because it’s not something I would ever do myself as I am drawn to creating more clean and bright things.